Palmetto Bluff’s Artist in Residence program offers unique learning opportunities, from foraging for edibles to dyeing textiles with indigo. 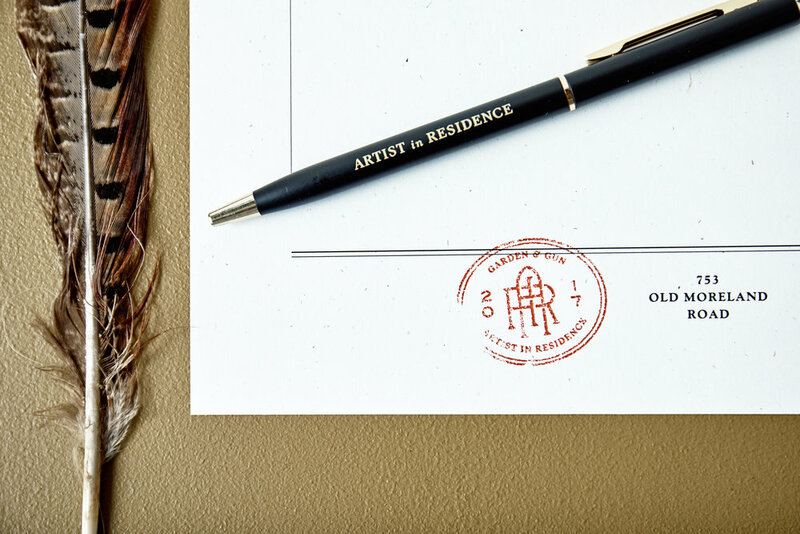 Artist in Residence is a collaboration between Garden & Gun and Palmetto Bluff that celebrates the arts, fosters creativity, and offers a hands-on education. The annual program invites notable artists, including winners of G&G’s Made in the South Awards, to stay in the Artist Cottage in Palmetto Bluff’s Moreland Village. Designed while working at Garden & Gun. The challenge when creating the Artist in Residence identity was that it had to feel cohesive with so many different artists. The AIR program changes every month and features anyone from paddleboard makers, to jewelry designers, to ice cream makers. A classic and timeless look and feel for the brand was appropriate. The identity, in a way, takes back seat to the featured artist so it had to be substantial enough to impress someone interested in the program but subtle enough to not draw attention away from the artists.